G42/NA double-header and much more. The undoubted historic highlight for 2010 was the return of an NA to Walhalla for the line's Centenary celebrations. The ever-popular Maldon experience saw double headed R class run to Bendigo and we join three wedding trains on three different gauges. The VGR ran double-headed J class for visiting English railfans. K 163 returned to steam at the Mornington Tourist Railway, whilst Y 112 was back on mainline duties at Ballarat. 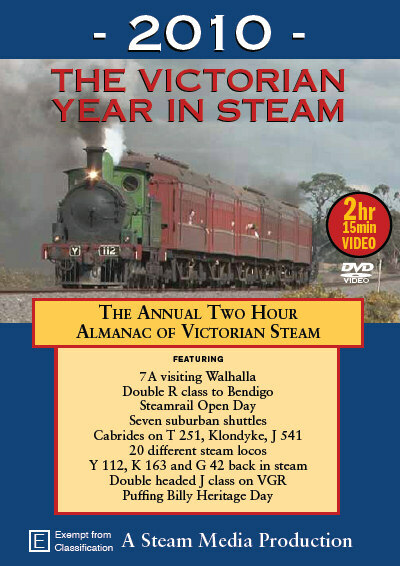 Puffing Billy ran a very successful Heritage Day and returned G 42 to steam on a Santa special. Steamrail staged another popular Open Day, added two new destinations to their shuttles stud and also ran many mainline specials. T 251 continued service on the Bellarine Railway where restoration work on Pozieres began. Recorded on 3CCD digital cameras, digitally edited and mastered. All colour, all original sound. Copyright (c) 2012 Stylized. All rights reserved. Designed by NodeThirtyThree for Free CSS Templates.